ULTIMAS INFORMACIONES DE LA ZONA. 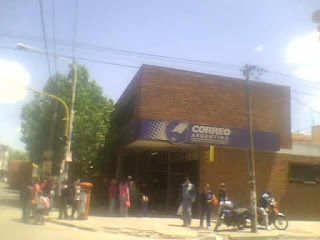 CORREO CENTRAL DE JOSE C. PAZ RESULTA CHICO CON LA ASIGNACION UNIVERSAL, MUCHAS BENEFICIARIAS SE AGOLPAN EN SU BUSQUEDA. ANDREOTTI LOGRO INSTALAR SU CONSENSO EN S. FERNANDO. EL EDIL TRAS UNA EXTENSA CAMPAÑA DE LA MANO DE SERGIO MASSA LOGRO TRIUNFAR. FUNDACION EVA PERON ----------------------------------------- SE INAUGURO EN JOSE C. PAZ, LA ASOCIACION CON SEDE CALLE POTOSI Y ALVEAR. Bº SAN MARTIN. SE TRATO EN EL CONGRESO EL TEMA DEL ABORTO AUTORIZADO. COSA QUE AUN NO SE LOGRO POR FALTA. DE QUOROM. EN SU MOMENTO SE LOGRARA. EN LOS PASILLOS SE COMENTO QUE HUBO GENTE QUE SE BORRO.